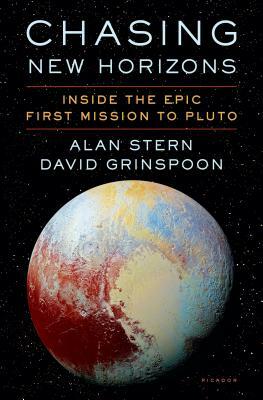 Called "spellbinding" (Scientific American) and "thrilling...a future classic of popular science" (PW), the up close, inside story of the greatest space exploration project of our time, New Horizons’ mission to Pluto, as shared with David Grinspoon by mission leader Alan Stern and other key players. On July 14, 2015, something amazing happened. More than 3 billion miles from Earth, a small NASA spacecraft called New Horizons screamed past Pluto at more than 32,000 miles per hour, focusing its instruments on the long mysterious icy worlds of the Pluto system, and then, just as quickly, continued on its journey out into the beyond. Nothing like this has occurred in a generation—a raw exploration of new worlds unparalleled since NASA’s Voyager missions to Uranus and Neptune—and nothing quite like it is planned to happen ever again. The photos that New Horizons sent back to Earth graced the front pages of newspapers on all 7 continents, and NASA’s website for the mission received more than 2 billion hits in the days surrounding the flyby. At a time when so many think that our most historic achievements are in the past, the most distant planetary exploration ever attempted not only succeeded in 2015 but made history and captured the world’s imagination. How did this happen? Chasing New Horizons is the story of the men and women behind this amazing mission: of their decades-long commitment and persistence; of the political fights within and outside of NASA; of the sheer human ingenuity it took to design, build, and fly the mission; and of the plans for New Horizons’ next encounter, 1 billion miles past Pluto in 2019. Told from the insider’s perspective of mission leader Dr. Alan Stern and others on New Horizons, and including two stunning 16-page full-color inserts of images, Chasing New Horizons is a riveting account of scientific discovery, and of how much we humans can achieve when people focused on a dream work together toward their incredible goal. Dr. Alan Stern is Principal Investigator of the New Horizons mission. A planetary scientist, space program executive, aerospace consultant, and author, he has participated in 29 NASA space missions and has been involved at the highest levels in most aspects of American space exploration. He lives in Colorado. Dr. David Grinspoon is an astrobiologist and award-winning science communicator and author. In 2013 he was appointed the inaugural Chair of Astrobiology at the Library of Congress. He is a frequent advisor to NASA on space exploration strategy, and is on the team for the Curiosity Mars Rover. Grinspoon's previous books include Earth in Human Hands (2016) and his writing has appeared in the New York Times, Slate, Scientific American, Los Angeles Times, and others. He lives in Washington, DC.